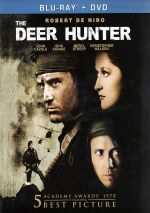 1n 1978, Michael Cimino directed The Deer Hunter. His second film, it earned a decent box office take and brought home five Oscars, including the coveted Best Picture prize. In 1980, Cimino directed Heaven’s Gate. His third film, it totally flopped at the box office and received brutal reviews. An unmitigated failure that nearly bankrupted its studio, Gate also threatened to harpoon Cimino’s career. It took the director five years to emerge from the wreckage, as he finally returned with 1985’s Year of the Dragon. Various Asian-American gangs rule the roost in New York’s Chinatown, and in general, the cops look the other way. However, NYPD Captain Stanley White (Mickey Rourke) doesn’t agree with the usual routine and he takes it on himself to battle a growing feud in Chinatown. This leads White up against crime lord Joey Tai (John Lone). Add an affair with Asian-American TV reporter Tracy Tzu (Ariane) and a combustible mix results. Given the manner in which Heaven’s Gate practically ended Cimino’s career, I’d like to report that Dragon reignited his cinematic prospects. However, the film got mixed reviews and didn’t exactly light up the box office. That’s one of the most laughable disclaimers in the history of disclaimers. In this disc’s commentary, Cimino details how much research he led into various communities, so the notion that any of this connects to real-life only in an “accidental” sense seems ludicrous. Whatever racism the movie may or may not feature, it comes with one basic sin: boredom. Flabby and meandering, Dragon offers a poor excuse for a crime thriller. Some of the responsibility lies with the actors. Rourke seems miscast as Stanley, partly due to age, as the then-32-year-old comes across as too young for the long-time cop. Rourke was old enough to qualify for the Vietnam veteran aspect of Stanley’s past, but it stretches credulity to view him as someone with so many years on the force that he’s the NYPD’s most decorated officer. Even beyond this issue, Rourke lacks credibility as a cop, mainly because he feels more like a street scumbag than a respected police office. As mentions in his commentary, Cimino intended some of this, as he wanted a story in which “good guy” Stanley feels “bad” while the traditional villain Joey comes across as more respectable. Whatever goals Cimino desired, this choice doesn’t work. Rourke simply can’t make Stanley seem like a believable character, flawed or not. At least Rourke fares better than the woefully untalented Ariane. A model prior to 1985, Dragon represented her first film role. And nearly her last, as Ariane’s pitiful performance rendered her acting career DOA. Wooden, flat and utterly incapable of any kind of humanity onscreen, Ariane threatens to ruin the movie. Or she would, if there was much movie to ruin. Cimino can’t decide where to focus his attention, so Dragon flits from one domain to another with little fluidity or logic. The film adapts a 1981 Robert Daley novel, and it feels like it took on the source story in a haphazard manner. It’s like co-screenwriters Cimino and Oliver Stone grabbed random chapters and tossed them together without real consideration of how they connected or flowed. Between the disjointed story, the lackluster characters and the iffy performances, I can’t find much to like about Dragon. Critics may assail it for racist tendencies, but they don’t need to go that far – bigoted or not, Dragon simply fails as a film. 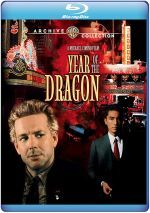 Year of the Dragon appears in an aspect ratio of approximately 2.40:1 on this Blu-ray Disc. The image looked better than I expected. Sharpness was usually fine. A couple of shots seemed a little iffy, but the vast majority appeared concise and accurate. I saw no issues connected to jagged edges or shimmering, and edge enhancement remained absent. In terms of print flaws, the image remained clean. Many 1980s films suffer from muddy colors, but those of Dragon mostly came across well. The tones occasionally demonstrated a little of the era’s flatness, but usually the hues looked fairly dynamic and vibrant. They never became runny or messy and mostly were distinctive and tight. Black levels worked fine, and low-light shots appeared well defined. Shadow detail appeared fairly clean and visible. Only minor issues cropped up in this largely strong presentation. Though it occasionally showed its age, the DTS-HD MA 5.1 soundtrack of Dragon came with real strengths. On the positive side, it featured a well above average soundfield for a movie from 1985. The soundscape seemed surprisingly active as the mix added a lot of different elements. Stereo imaging for the music was broad and involving, and effects spread nicely across the front. Those elements were a little more speaker-specific than I’d like, but given the age of the material, I easily forgave that. The pieces moved reasonably smoothly across the speakers, and the surrounds contributed a fair amount of information to the track. They kicked in nicely during action sequences and provided pretty engaging environment through the whole flick. Audio quality appeared fine. Speech seemed reasonably clear and distinct, and intelligibility never turned into a problem. Effects presented fairly clean and accurate material. Some distortion occurred – usually attached to gunshots – but those concerns weren’t significant. Music was rich and warm, with pretty solid low-end response. This track failed to stand out as terrific, but it worked fine considering the age of the film. In addition to the film’s trailer, we find an audio commentary with co-writer/director Michael Cimino. He offers a running, screen-specific look at how he came to the project, research and working with co-writer Oliver Stone, sets and locations, music, cast and performances, stunts, action, cinematography and reactions to the film. Though Cimino does offer a screen-specific affair, he approaches that task in a loose manner, so expect him to go off on many tangents. These moments actually fare best, as Cimino discusses aspects of his relationship with Stone as well as others like Clint Eastwood. When Cimino gives us these memories, the track works well, but the discussion seems a bit less engaging when he concentrates on Dragon specifics. Still, the commentary proves largely informative and enjoyable despite occasional lulls. Michael Cimino’s return from cinematic exile, Year of the Dragon didn’t do much to resurrect his career. A clumsy, disjointed crime drama, the movie never gets into a groove. The Blu-ray brings generally positive picture and audio along with a reasonably engaging commentary. Dragon lacks much to turn it into an exciting film.